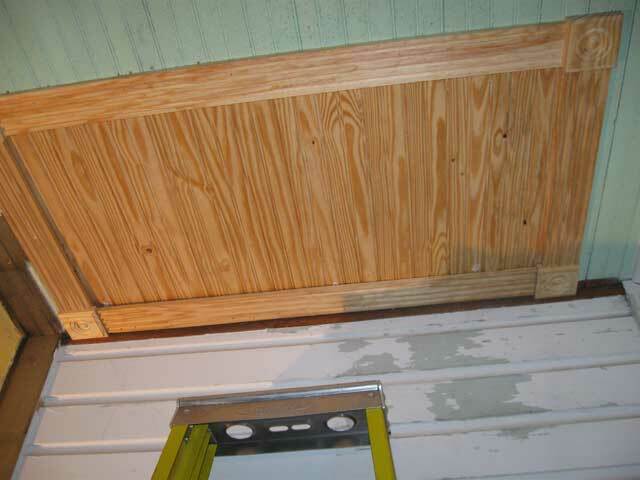 The attic over the sunroom and utility room had a very small opening, rudely hacked into the beadboard ceiling. It was so narrow I couldn’t even get my shoulders through it without contortions…much less the rest of my rather rotund self… The hole wasn’t square either and simply had a wood piece that was pulled over the hole to close it. I wanted something a little nicer. Anyway, I put in a new attic door…in beadboard. 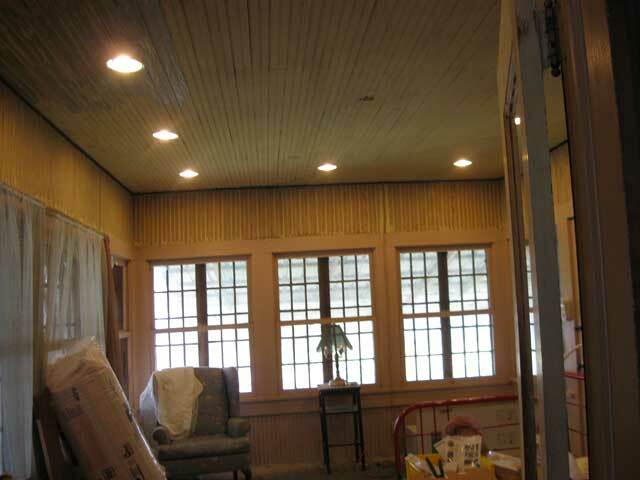 Not painted yet as we haven’t done the rest of the ceiling yet. I did all that so I could get up there and pull some new circuits. I say “I”…but I had unexpected help this weekend too. Thanks Mike! First, I ripped out all the knob and tube…and years of associated zip cord splices and add-ons. Scary stuff. Very satisfying and very glad it’s gone. Not everything old should be preserved. Got my circuits run. And lo and behold…LIGHTS! Blessed lights! When we got the house, this room was lit by a single light bulb. There are now more bulbs in this room alone than there were in the entire house when we bought it! There’s still a Victorian-ee bowl-light and ceiling fan thingee to go in the center of the room…but I’ve more crawling around in the attic to do first. Oh, and I’ve got some fancy covers for these…Sort of Victorian attitude. Yeah, can lights aren’t exactly period…but they are just part of the picture anyway. Remember for lighting. General/Ambient. Task. Mood. These are the general/ambient. Period lighting for this house would be exceptionally easy. Electricity was added after it was built. There was NO period lighting (in electric anyway). We’re not going back that far. But lord have mercy…we can SEE in this room! It is truly amazing just what a difference a bit of light can make. Mood, atmosphere, everything is better. Except the paint. Ghack…makes the puke yellow and pepto-bismal pink clash a bit. Paint coming soon! One Response to *blinks* By the gods! We can see!